1. ASK THIS ONE QUESTION. How many times does your child ask if you could play with them? When they’re young, they probably make this request multiple times throughout the day. Imagine approaching your child and asking them if they would like to spend time with you? Whether you play together, go for a walk, or simply chat on their bed, this experience will be more meaningful, because you approached them. 2. DO SOMETHING IMPORTANT WITH THEM. Would you like to help me pick out the plants for the garden this year? Would you like to help me plan the dinner menu for this week? (You could even put them in charge of a day). Want to help me change the oil in the car? Do you want to help me mend this blanket? Want to help me map out our road trip? Would like to help prepare the dinner for grandma and grandpa? If you want to have some more in depth talks (or if you’re looking for some great conversation starters) then check out this resource! It’s full of clever ideas to initiate a great discussions with your child. 4. GET OUTSIDE WITH THEM. collecting rocks, sticks, leaves, etc. At the end of the day make sure you’ve got ample time to read, snuggle, talk, and tuck-in your child. No matter how tired you are, or how much you’re needing that glass of wine, don’t rush this part of their routine. Even if you had a crazy day, a scheduled bedtime check-in helps you end things in a positive way. Being a parent is challenging! There are so many demands and at times it may feel like everything (and everyone) is vying for your attention. 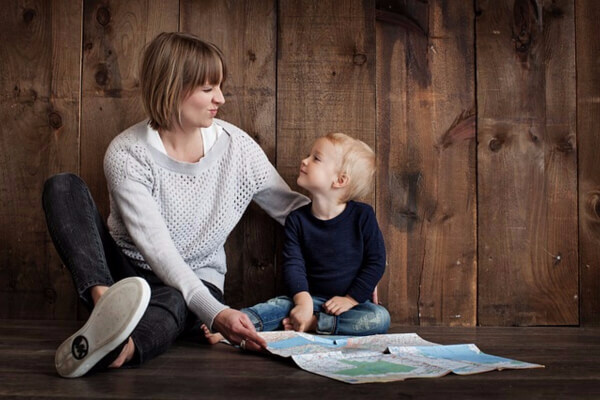 Don’t let the busyness of life rob you of connecting with your child. It’s never too late to spend quality time with them. 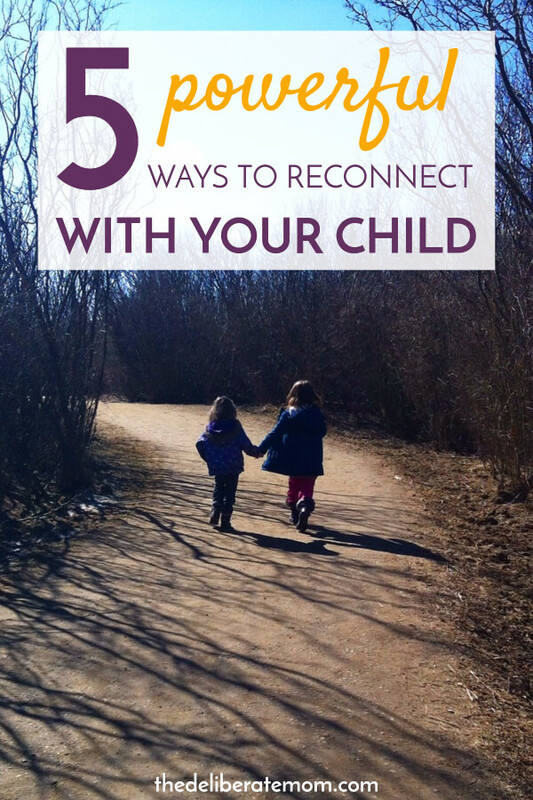 Try these suggestions and you may be surprised just how easy it is to reconnect with your child. As usual you hit the nail on the head with these suggestions. I really love that first one. I know Madison loves to ask me to play with her and I sometimes brush her off because I’m working. I need to stop doing that and get on her level. Wanna know why? My 16 and 12yr old now does nothing with me. When I ask, THEY are the ones who’re busy or don’t want to. So I’m going to spend more time with Madison and hopefully it’ll continue all the way to adulthood. I love your suggestions. Des is still in preschool so Thursdays are our “big (or small) adventure days. I really love all the connections we make for a full day. Talking, asking and answering questions, check-ins, etc. It’s harder with Scarlet because she’s on the go more – with school, lessons, friends. I think the end of the day check-ins or our breakfasts together are so important. One on one time with both kids is crucial for us. Okay it makes me feel good to know I already do a lot of these things. My daughter and I are going to plant some flowers today! Even I’m excited for it! 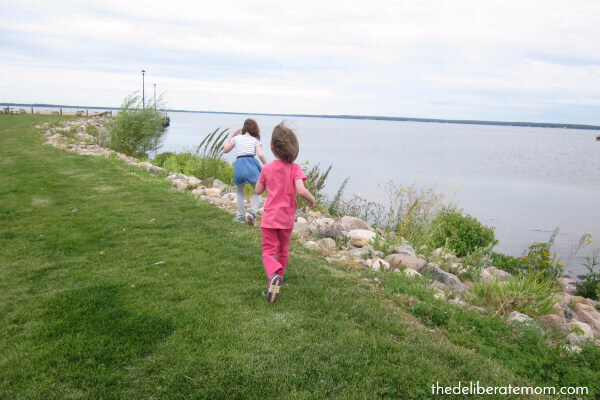 As my children get older I see how much more intentional I need to be about reconnecting with them. I mean, who can compete with their devices? But I love, reconnecting at bedtime and value those tender moments to listen to their hearts. It’s such a precious time. Thanks for these tips, Jennifer! You absolutely described me- always a blur and I wonder often if I had any meaningful quality time with my kids by the end of the day. Jennifer, these were excellent ideas. I especially like the idea of asking to spend time with our kids- they always beg us to do that, and turning it around would be a huge and wonderful surprising blessing to them! You’re so very welcome Jennica! I’m delighted you enjoyed this.